IGNITE your day! That’s the ARI way. Our global intranet launched merely a year ago; yet, in that short time the site has become an institutional fixture. Simply put, IGNITE is the place to go for what you need. In addition to serving as a valuable business resource, we utilize IGNITE to feature ARI’s most valuable asset—our people! From inspirational Leadership Blogs, to our weekly Employee Ten-in-Ten feature, we make sure IGNITE shines a spotlight on all of ARI employees. I consider myself the luckiest person in the world to work for such an amazing company like ARI and to have the opportunity to manage our IGNITE site. Our team strives to keep the site beautiful, fresh and an effective business tool. Thank you to all of the ARI employees who continually support IGNITE and who have been instrumental in making it the huge success that it is today. IGNITE your day! Every day, I ignite my day with our intranet. The intranet ties our family together with personal stories, news, business updates, and so much more! It is the communication glue of our culture. Ignite keeps you well informed. If you can’t find it, just ask and it will be available. Ignite has new content every day that keeps me coming back again and again! It’s the best place to go for internal news and to get inspired – LOVE the leadership blogs, and the Ten in Ten employee spotlights. I’m learning things I never knew about colleagues that I’ve worked with for years! 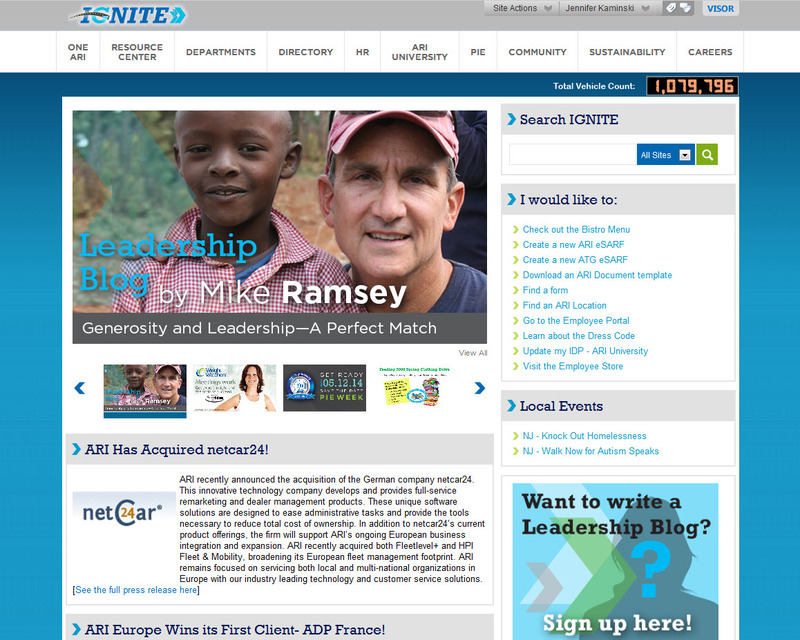 ARI is my home away from home and IGNITE allows me to stay in touch with people and event information for ARI.Great Leadership Blogs and useful information about our company and industry is right at our fingertips. When traveling or working from the road, Ignite is a great and easy way to stay connected to and see what’s going on at the home office. It’s also a very effective tool for navigating the directory of our company, quickly getting you to the right person. IGNITE is the first application I open everyday! I work in the UK and IGNITE enables me to keep up to speed with everything that is going on with ARI Globally. I am able to check who works in the many departments that I interact with, see their contact details and picture so that when I call them I am able to visualise who I am speaking with, even though they may be in a different area of the UK or accross the other side of the world. ARI is a Family, the 10 in 10 interviews and leadership blogs help everyone share experiences and life stories. Ignite is the starting point for anything I need – whether it’s details on an upcoming event, collaboration tools to communicate with my colleagues, or blog details from our leadership and amazing staff — it’s all there. It seems like the site is constantly growing and improving – really living up to the ARI focus on being better tomorrow than we are today. Great job to the team behind the Ignite curtain.